"Catholic AIDS Workers: Pope Echoing Us On Condoms"
"...But parish priest Rev. Didier Lemaire showed no embarrassment when asked about the stash of 600 condoms, set conveniently on an examination couch so one could grab a few on the way out the door. Lemaire said Pope Benedict XVI's groundbreaking statement about the selective use of condoms only cements what Catholic AIDS workers have said for years." "What the pope is saying, many priests have been saying for a long time," said Lemaire. He said eschewing condoms when people have AIDS goes against the commandment "Thou shalt not kill." "Pope Benedict's comments have far-reaching implications for Africa, the continent with the highest numbers of AIDS victims — and the fastest-growing number of Catholic converts. But it is more important because the Catholic Church is the biggest private provider of AIDS care in the world, providing antiretroviral treatment, home-care visits and counseling to one in four of the world's 33.3 million AIDS patients, according to the Catholic charity Caritas International. In 2008, members of the Catholic HIV and AIDS network spent 180 million euros (about $235 million) on assistance, it said. " 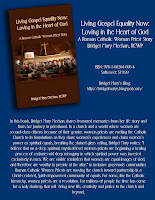 New Blog by Diane Dougherty/ RCWP coming to Atlanta! 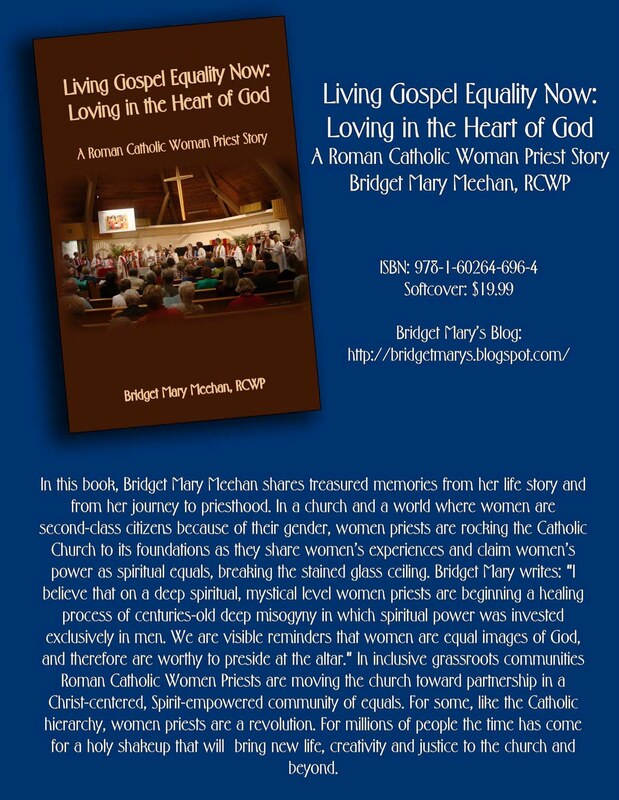 Enjoy this beautiful blog by Diane Dougherty on Roman Catholic Women Priests! We miss the point about Advent. We really do. Let us look briefly at these First Sunday of Advent readings and then let us look at some serious points about how we should be reflecting on Advent. The reading from Isaiah tells us to be happy! The words excitedly encourage us to climb the Lord’s Mountain and to walk in the Light of the Lord! Who said anything about “drab advent” there? The response on the psalm is “Rejoice in the House of the Lord.” We know that so often the whole liturgical theme can be found in the psalm. Here it is! Rejoice!! And in Matthew we hear we are supposed to stay awake because we do not know when the Son of Man is coming. Notice how all of these readings are exciting! They are happy! They are upward looking! Why, oh why, do we look at Advent with this glum pretense of mourning??? We should be excited and happy – just as the readings exhort us to be! This is not a season of solemnity; it is a season of rejoicing! I remember the first time I wrote about Advent. I was heading for Chicago. Here is a quote from what I wrote back then. I can still feel that Advent excitement. I still know what I meant as I dashed to the airport to spread that metal bird’s wings toward the Windy City. But, what does this coming – or this preparation – mean to us in this Advent of 2010? How can we be an Advent People when we are faced and raced with the five week holiday season? And isn’t it a non-stop holiday? For those of us in education, we know that the time between Thanksgiving and Christmas is an academic wasteland! We know that this is true regardless of the level – kindergarten through graduate school. If asked what this Advent Season means, most people will make a brief statement about how we are getting ready for Christmas and then they will start saying something about what Christ should be to or in the world. Maybe they will even start talking about putting Christ back into Christmas! Most of us avoid what Advent means to us personally as a part of the Church calendar. We may mouth the words – but we forget the meaning. Maybe we don’t really forget the meaning; maybe we simply don’t have a solid grasp of what that meaning is. Sometimes clergy (of various denominations) try to impose a guilt trip on people who are getting ready for Christmas too early. How silly!!!!! This is that “put Christ back into Christmas” theme. But, Christ is in Christmas. And we’re having a party! Christmas is a great party! Of course it is! Sure, we can go back into the pagan origins of the feast and we can make pious statements about the first official ecclesial celebration of Christmas in 359 (or was that 353?). But, what does it prove? Absolutely nothing! Regardless of how the feast of Christmas came about, the thing is that for almost 1700 years people have been celebrating the birth of Christ! And for almost that long, people have – in one way or another – been preparing for this great birthday party! Yes, He is coming! And this is our time of preparation! But, party preparations are not all somber and sad! When was the last time anyone got ready for a great party by donning sackcloth and ashes? No way! We are preparing for a party! A salvation party! Let us celebrate! If we are planning a wonderful party, don’t we play music? If we are planning a wonderful party, don’t we laugh with our friends? If we are planning a wonderful party, don’t we decorate our homes and put out festive things so the guests will be welcome? Of course we do! And, I believe that that is what our Advent should be about! Yes, we are getting ready for the birthday of our Savior. And we are getting ready for it in fine style because we already know he will arrive safe and sound. Oh, we will not be able to see Jesus in person at our tables and around our Christmas trees. But, he is coming! And Advent is the time that we are preparing for that coming. Oh, wait! Maybe we do see Him! Maybe the Christ, whose birth we await on Christmas day, is seen in every person who stops by during this Advent season! Maybe the Christ is seen in every person who sits at our tables. Maybe the Christ is seen in every family member who is or was or will be a part of that circle of people we love and rejoice with! Maybe the birthday presents we have for that Christ are the presents we wrap for each other! After all, we see our party guest of honor in every person we wish “Season’s Greetings” to. Don’t we? The third Sunday of Advent is Gaudete Sunday – and Gaudete means rejoice (because it’s half over!). Oh, I think we should rejoice the whole time!!! All of Advent should be Gaudete! Not because Advent is half over at any given point. But, rather because we are reminded so clearly of the coming of our Savior in every person we see, in every decoration we put up, in every meal we prepare, in every visit we make, in every present we wrap. This is a wonderful season! Gaudete!!!! Let us rejoice! We’re going to have a wonderful party – and we are now having a wonderful time preparing for that party! Play the music! Deck the halls! Sing and laugh and be in Christ’s love with one another! Oh yes, Chicago, Phoenix, New York, London, Paris, Tokyo, and on and on! Rejoice, Chicago, Phoenix, New York, London, Paris, Tokyo, and on and on! I am coming to be a part of the wonderful party preparations! Jesus – thanks for being – and thanks for this opportunity to rejoice with each other as we see the Christ in every person we meet – and we are getting ready for a great party! Let us have a wonderful time preparing for our Christmas party – as Jesus reminds us once more that we are the People of God!